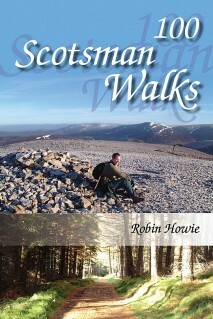 Hillwalking is a way of life for Robin Howie, whose name is very well-known in Scottish hillwalking circles and whose knowledge of the Scottish high tops is second to none. For over ten years his popular weekly hillwalking column has appeared in The Scotsman where his pleasure of walking in the hills is apparent to the reader. Some claim to buy the paper solely to read his column while others have long-demanded that his walks be made into a book. Generous with his help and advice to other walkers, this collection of shorter, lower-level walks will appeal to families and those less sure of venturing to the high tops. Conveniently arranged within shires with a location map, each walk has a useful factfile that summarises the map, start point, distance, terrain, duration of walk, height to be climbed and the all-important nearest refreshment point. 100 Scotsman Walks is a distillation of a lifetime of highs and lows, enhanced by the artist’s eye and the wordsmith’s descriptive powers. It will be a delight for active or ex-walkers, for the would-be explorer or armchair enthusiast, for the whole family, young or old – a book in fact for everyone. It will be a delight for active or ex-walkers, for the would-be explorer or armchair enthusiast, for the whole family, young or old – a book in fact for everyone.